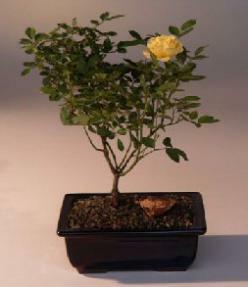 This tiny yellow macro mini rose is a bloom machine in miniature growing only to 9" tall. It has light green tiny leaves with a compact uniform growth habit. This disease resistant variety produces well shaped blooms up to 1/2" diameter. It has a delicate yellow color, with soft petals. Their color softens just before petal drop as the tree readies itself for another flush of blooms. It flowers profusely from spring through early fall. Keep outdoors and protect in winter. Recommended outdoor flowering, deciduous bonsai tree, grown and trained by Bonsai Boy.